Amidst rising international concern about the human rights implications of a trans-oceanic canal in Nicaragua and concerned with implications for the people residing within the Colombian island of San Andrés, Colombia had requested this opinion from the court in 2016. 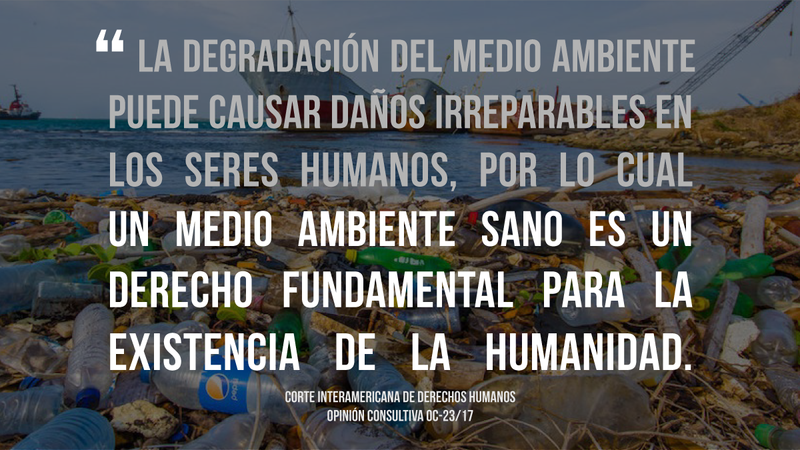 In January 2017, several ESCR-Net members submitted observations to the Court about the environmental threat of such projects in the Caribbean and the responsibility of states to protect the right to a healthy environment as a human right. Interamerican Association for Environmental Defense (AIDA), Center for International Environmental Law (CIEL), and Centro Mexicano de Derecho Ambiental (CEMDA) were among the organizations that provided input on the legal questions under consideration by the Court. This Court opinion is precedent setting as it specifically enumerates the responsibility that states hold in protecting healthy environments and other environment-related rights. Notably, the Court included extraterritorial obligations (ETOs) in its advisory opinion, saying that states’ human rights obligations extend to all people, even those outside of a states’ borders. Climate change was also explicitly mentioned in the opinion, asserting that the right to a healthy environment is both an individual and collective right that includes current and future generations. Already, this Inter-American Court of Human Rights’ opinion has positively affected a recent case filed by another ESCR-Net member. A Colombian court had ruled against a group of 25 young people who petitioned their government to stop deforestation as it violates their right to a healthy environment. Now, Dejusticia plans to appeal that decision.